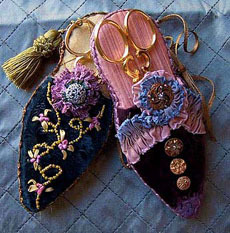 This handy Victorian Slipper will house your favorite scissors and keep your pins and needles close at hand. This shoe opens like a book and within the pages you will keep your needles, pins and safety pins. All adorned in delicious Victorian looking trims and ribbons and buttons. Your finished Slipper will measures 6 and 1/2 inches.